Michael P Stadnick is one of the original partners of Desmarais LLP, where his practice focuses on the trial and litigation of complex, technology-driven disputes, including patent infringement, trade secret, unfair competition, antitrust and licensing disputes. He has served as trial counsel in cases involving a broad range of technologies, including biotechnology, pharmaceuticals, computer hardware and software, electronics, semiconductors and telecommunications technology. After graduating from New York University School of Law, Mr Stadnick began his career at Kirkland & Ellis, where he was named partner in 2006. 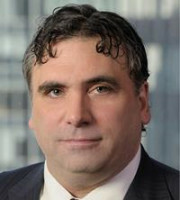 Having litigated numerous high-profile cases at Kirkland, Mr Stadnick departed the firm in 2010 to join Desmarais LLP, where he has continued to represent both leading technology companies and smaller innovators in disputes worth billions of dollars in potential damages. Mr Stadnick has also assisted clients in negotiating settlement and licence agreements, and has represented and counselled clients in strategic patent licensing matters. Mr Stadnick is admitted to the New York Bar, as well as the US Court of Appeals for the Federal Circuit and various federal district courts.